Is it all ice and snow where you live? 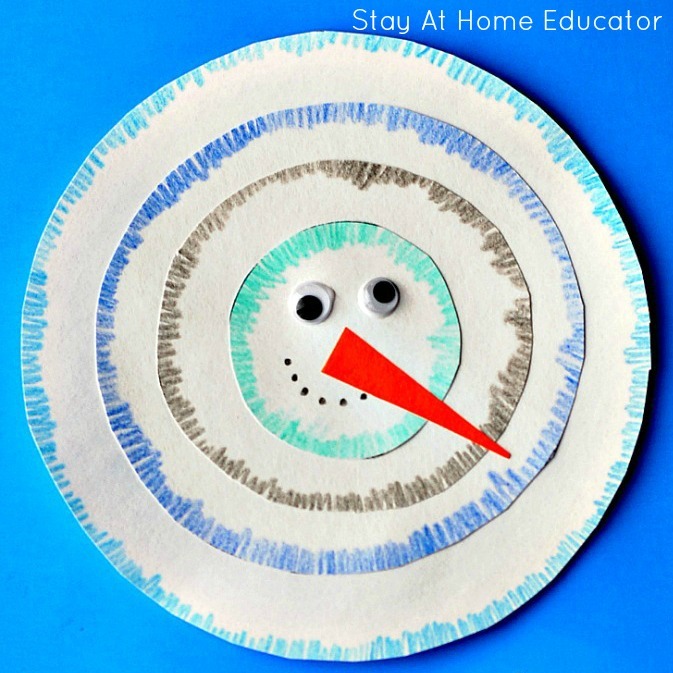 No matter your answer, preschoolers will love these winter math activities that features “icicles” and “snowballs”. 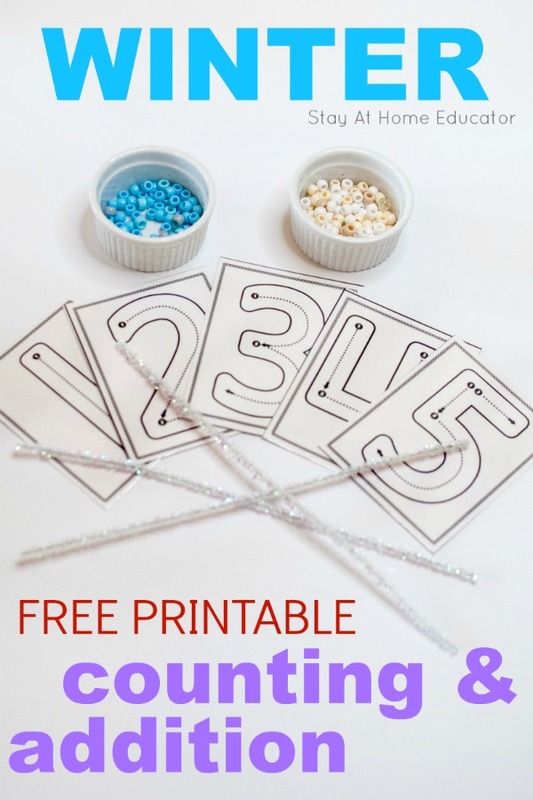 This post features a free number formation printable, so be sure to grab it from the end of this post! The fascination with ice and snow is endless at my house. They are desperate for snow. And while we live almost exactly halfway between the equator and the North Pole, to be specific, despite the freezing temperatures we seldom get snow. What disappointment when he realized the snowflakes were never going to accumulate enough to make a single snowball, let along an actual snowman. So, I have to compensate a bit. Because when kids are fascinated with something you have to take advantage of that interest and use it to teach a variety of skills. 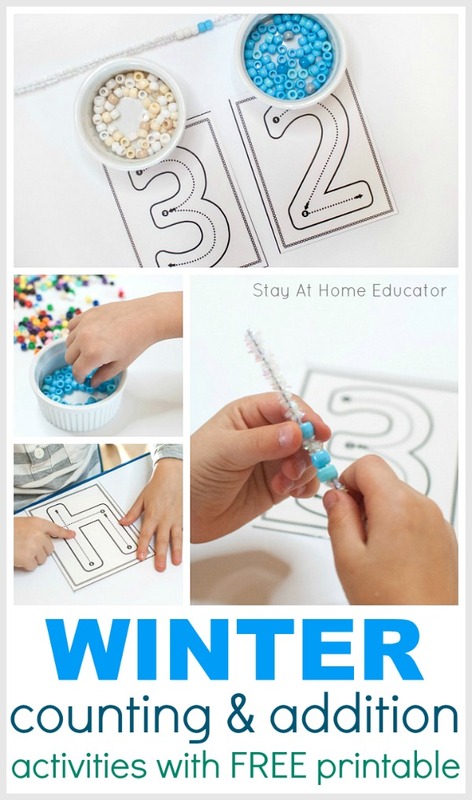 And that’s exactly where these winter math activities come in. 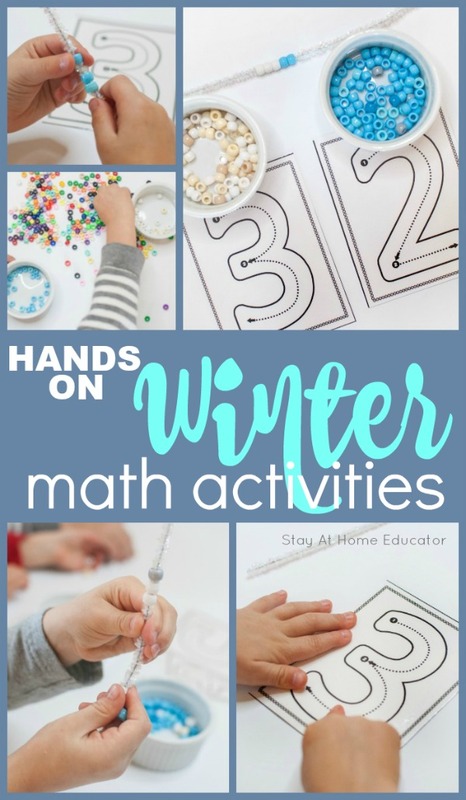 With a single number formation math printable and a few materials, I’ll show you five winter math activities for preschoolers! 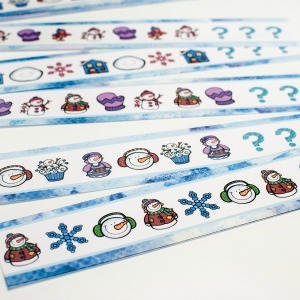 They’re perfect for your winter theme. 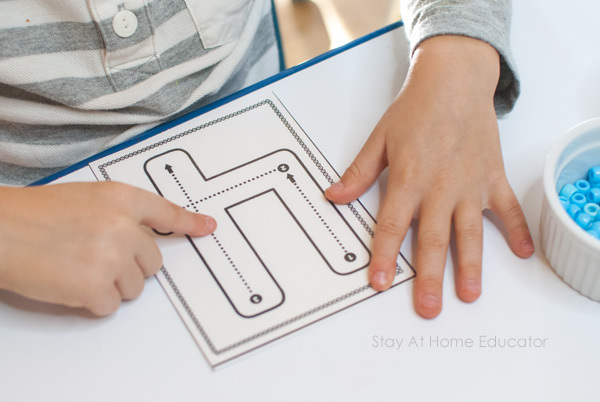 Don’t’ forget the number formation cards are a free math printable at the end of the post! 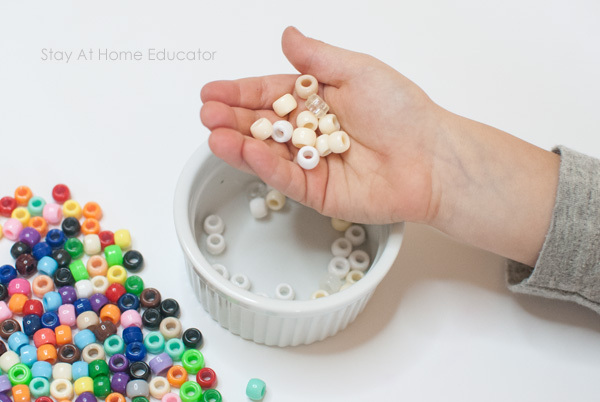 Place the pony beads in a bowl, all mixed up. 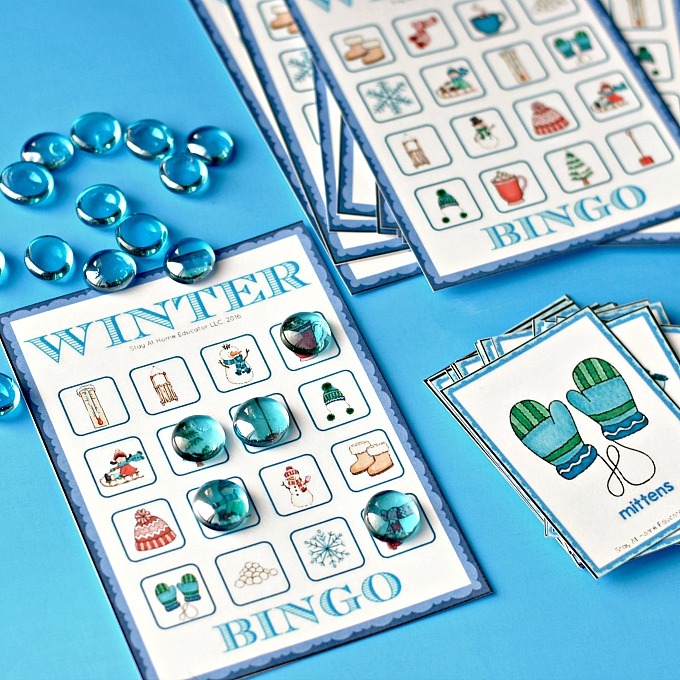 Alternatively, you can invite your preschooler to sort out the wintery colors from a larger set of beads. 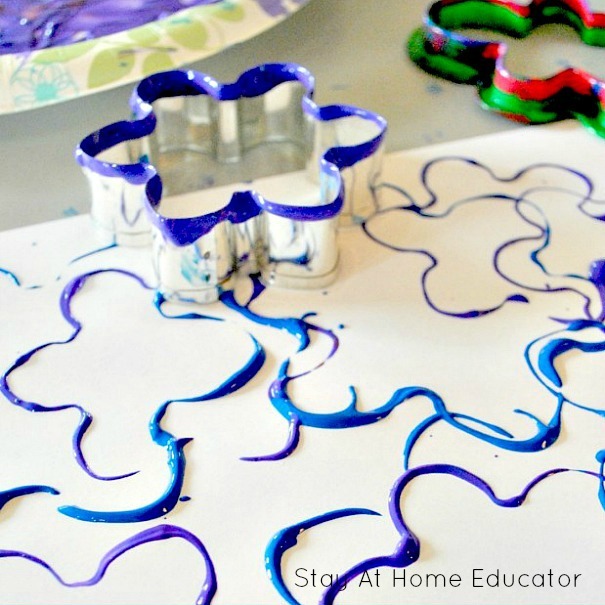 (That’s a super easy activity to add to your sorting lesson plans in preschool math). 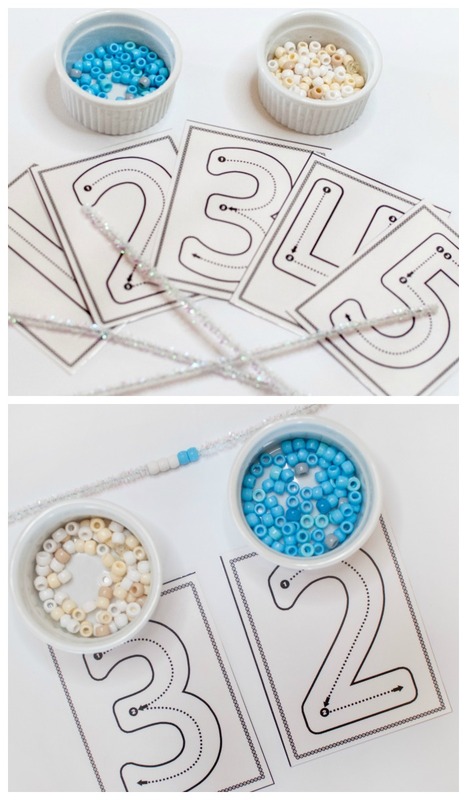 Set the bowl of beads and the iridescent pipe cleaners on a tray with the printable number cards and invite your preschoolers to join you in a little fine motor fun! My little boys and I started by reading some winter themed picture books, of course, because that is such an important piece in learning! My boys love being read to! 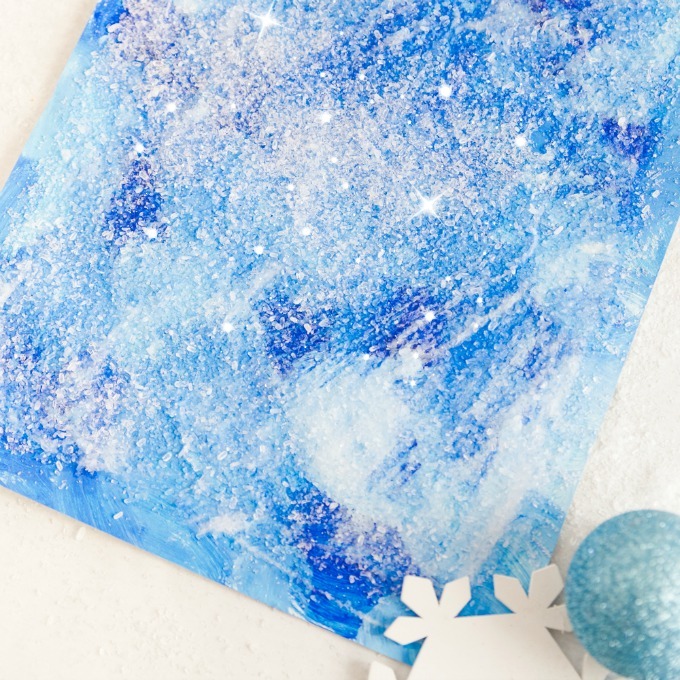 But the main reason we started our winter theme unit with lots of picture books is because I wanted my boys to see multiple illustrations of snow! (Remember, the lack of snow where we live?) 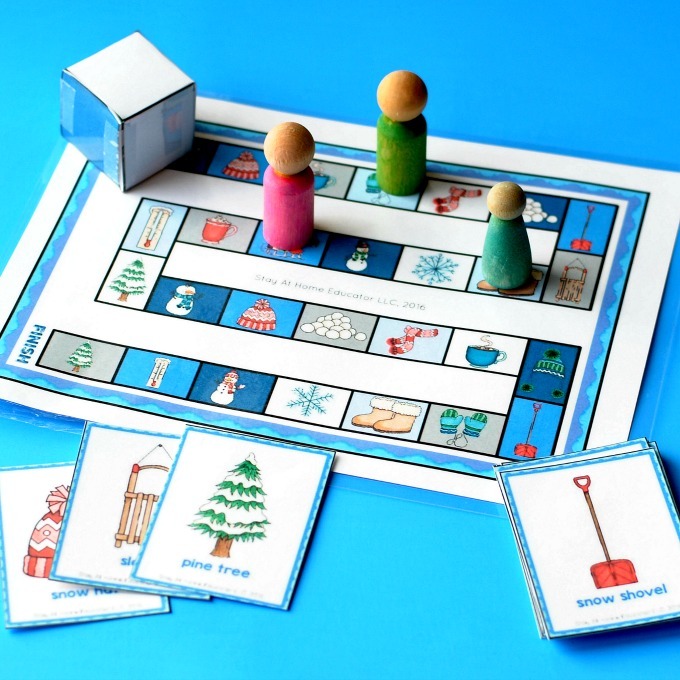 Those illustrations lead us into the discussion we needed to have about the snowballs in our winter math activities. So, I invited my boys to sort out all the winter colored pony beads. As you can see, we were not limited to white and light blue, but there were a few grays and off-whites in there, too, which is totally ok! It’s winter! Sorting out the pony beads required a lot of skill work as they delicately picked out the winter colored pony beads. And sorting is one of the first math skills related to algebra! In fact, I spend several weeks working on sorting skills with my preschoolers. 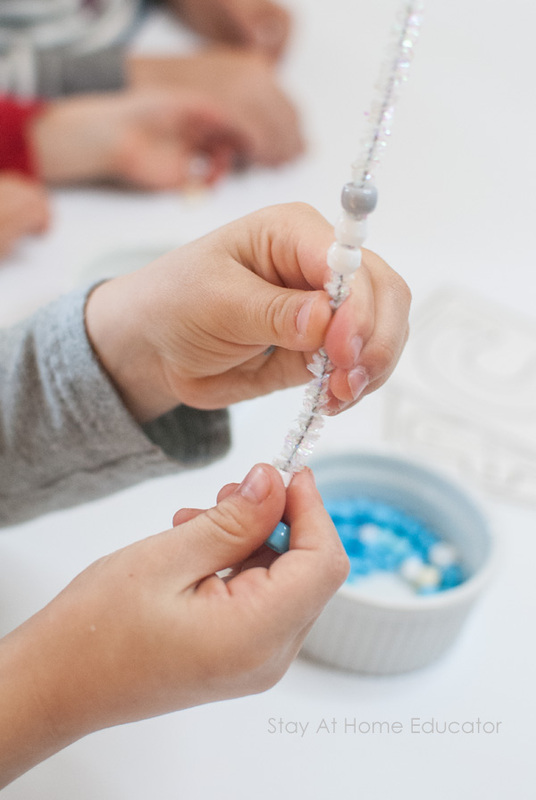 After the beads were all sorted out, I allowed a little time for my boys to just add the beads to the pipe cleaner. That’s when we decided that the beads were snowballs and the pipe cleared were icicles. 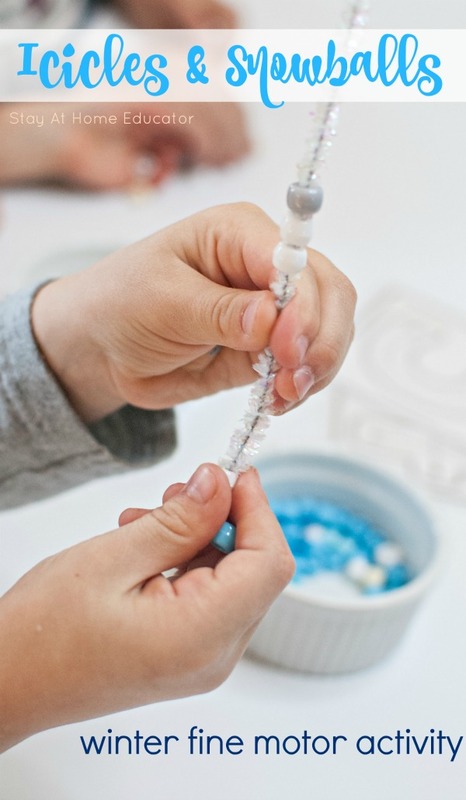 So the boys “poked” the snowballs with icicles as they practiced threading the beads onto the pipe cleaner. 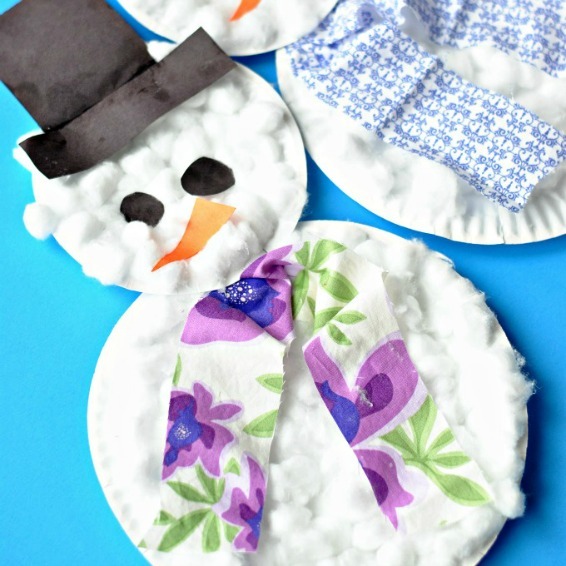 This is fantastic fine motor work, and you gotta’ love having a winter theme to it, too! When the icicles were full of snowballs, we counted together as each snowball was pulled off and placed back into the bowl. The boys were able to count easily to about 15 before they lost track and I modeled counting to finish for them. After the initial activity above, I then offered the boys number formation cards. We’ve used these for a ton of activities before, but this is the first time I’ve ever shared them on my blog. The boys drew a card at random, traced the number with their finger, and then counted out the corresponding number or snowballs onto their icicle. Alternatively, you can also place these number formation cards in a dry erase pocket and use dry erase markers, too. Sometimes I offer them that way just to make them seem new again. Later in the week, we followed the opposite of the above activity and the boys added a few snowballs before finding the corresponding number card from a pile. 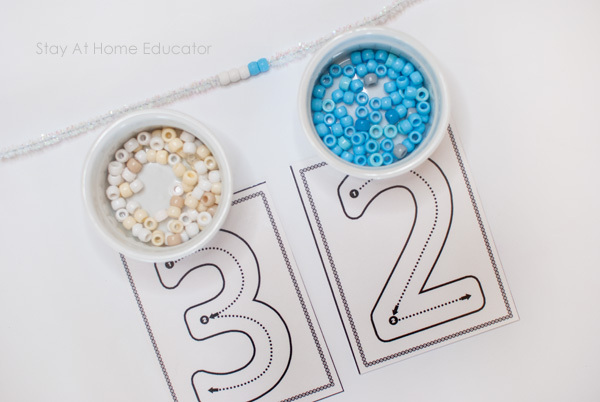 Once selected, they traced the number with their finger and then identified the number, followed by one more time counting as they removed the beads from the pipe cleaner. Since we were working with two basic colors, blue and white, some addition practice naturally came about. One of my little boys drew a number formation card, and both boys identified the number and traced it with their finger. Then, they added the corresponding number of beads…in a single color. You have three white snowballs, and then you added two blue snowballs. So now you have five snowballs on your icicle! You started with three white snowballs, then you put on two blue snowballs. Now you have five snowballs! 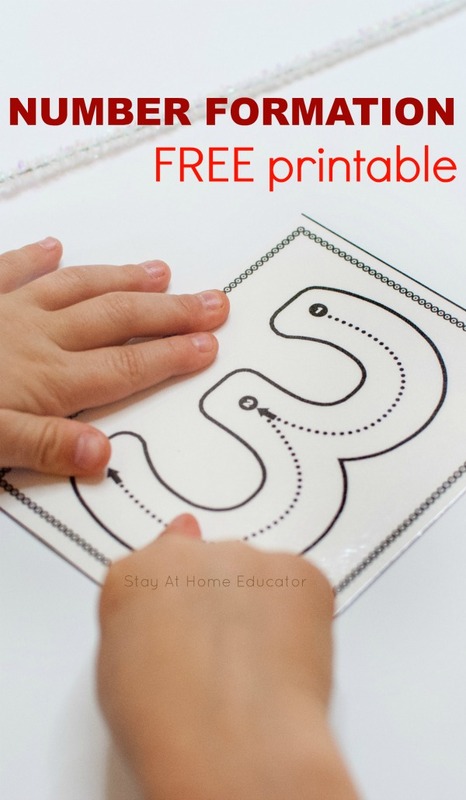 The addition activity can be done in reverse to teach subtraction, too! 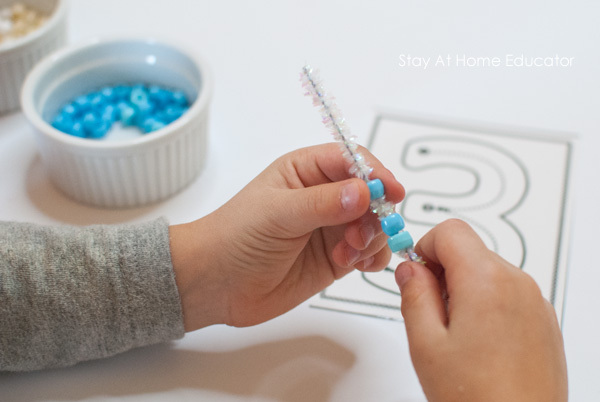 For this activity, I invited my little boys to add a certain number of beads to their pipe cleaner. Keep it under ten, for most preschoolers. 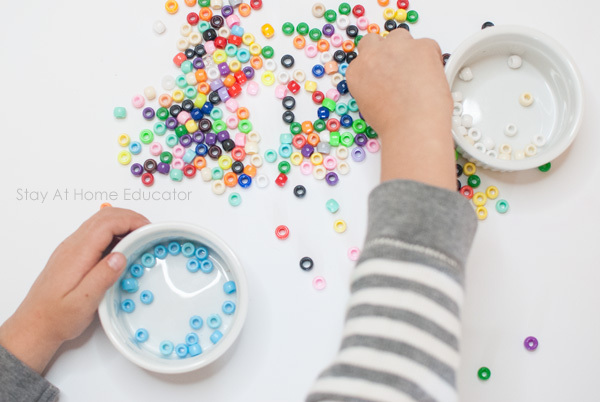 Then, invite your preschooler to carefully remove all the beads of one color while leaving the other color on. We started with seven snowballs. Two of them were blue, and five of them were white. We took the blue snowballs off. Look, now we only have five white snowballs left! 7-2=5. Finally, I invited my little boys too sort through the number formation cards to find the corresponding numbers that matched the number sentence they made. Want the FREE Number Formation Cards? You can grab them right here! I’ve used them for a ton of activities, so stay tuned for more! Just click the image below. 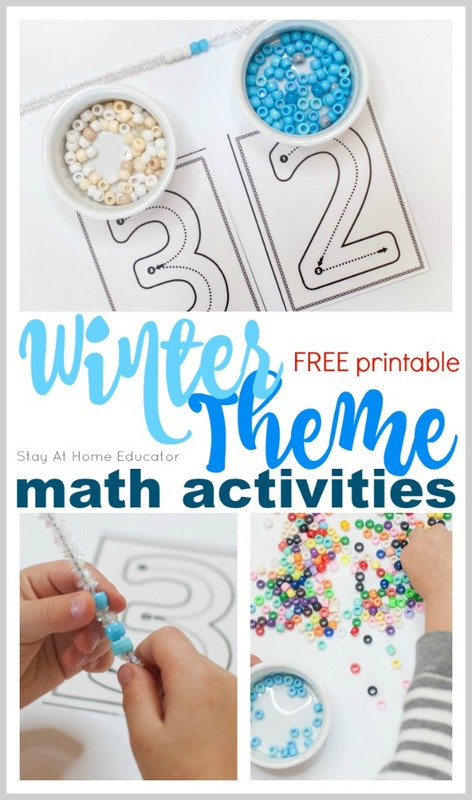 Then keep reading for more winter printables and activities!